The other-worldly shafts of rock soar above a barren sienna-hued landscape. Turquoise skies arch overhead. You know you’re in the Western United States when the camera pans across this light-drenched landscape. Guess what? This iconic scene is not special effects. The Navajo people have been grazing their sheep here for hundreds of years. 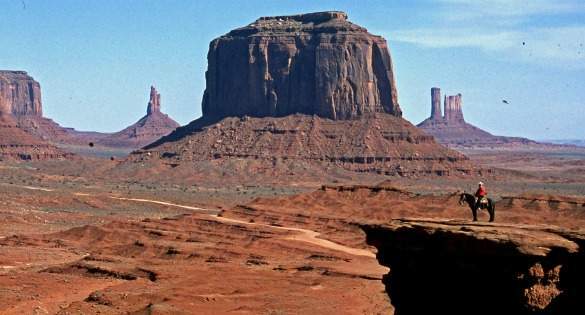 Why not visit the Navajo reservation and become the star of your own Western movie? Unfortunately, many people who do not live in the Southwestern United States have only the vaguest idea of what an Indian Reservation is. Can they travel there? Will they be welcome? What is there to see besides the John Wayne landscape? Here are ten tips for visiting Diné Bekeyah (Navajo Land). 1. Where is the Navajo reservation and how do I get there? 2. What special preparation should I make? Be sure you have a good map of the reservation–one that will show the dirt and gravel roads that lead to the heart of the land. You can use a topographic map or buy a reservation map along the way. Fill up the gas tank before you leave and whenever you have a chance. There are no freeways and gas stations are sparse. The sale of alcohol on the reservation is prohibited, so if you want something stronger than iced tea and soft drinks, bring your own. Dress casually and bring your hiking boots, because trails meander across some of the Navajo and national parks into striking scenery. 3. Do I need any permissions to visit? Even though the Navajo nation is a sovereign entity within the United States (Navajos are citizens of the United States) you will not need a visa to visit. The reservation is not a gated community. In fact, you probably will not realize when you first enter Diné Bikeyah. The exception is that you will need a permit from the Division of Natural Resources if you plan to hike and camp in the back country. 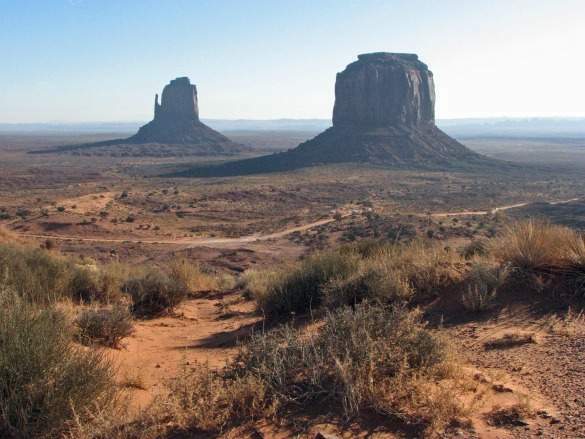 You will also need special permission from the Navajo Nation if you will be doing research, interviewing Navajo people, or taking commercial photographs. In those cases, it is wise to contact the Cultural Affairs office (part of Historic Preservation Office) in Window Rock for formal permission. 4.How can I familiarize myself with Navajo culture? For cultural information that is fun to read, dig into Tony Hillerman‘s mystery novels. His detectives Jim Chee and Joe Leaphorn operate out of Window Rock, the capitol, and Tuba City on the Western edge of the reservation. Hillerman’s Navajo policemen cover pretty much every arroyo, canyon and mesa of Navajo land during their adventures in 18 novels. Several excellent museums in the area can help you understand the culture of the Navajo and other Southwest American Indian people. If you land in Phoenix, visit the Heard Museum. On your way through Flagstaff, be sure to stop at the Museum of Northern Arizona, or in Santa Fe go to the Museum of Indian Arts and Culture. Finally, tune into Navajo radio (KTNN, 660 AM) as you drive and drink in the language. 5. How can I be a good guest? Common sense prevails here as anywhere you travel. Don’t trespass. Ask permission before you photograph a person. You may find costumed Navajos doing picturesque things like herding sheep in Monument Valley or weaving a rug near a trading post or hogan. They probably are there for the express purpose of becoming a photographer’s model, and expect a couple of dollars tip. Guides, too, often subsist on tips. The people who live here are not museum displays. They are human beings who come from a different cultural background than you may be used to. And although they may be wary of visitors, when they know that you are genuinely interested in learning about the Navajo and their lands, they will be helpful. 6. What are the Must See sites on the Navajo Reservation? 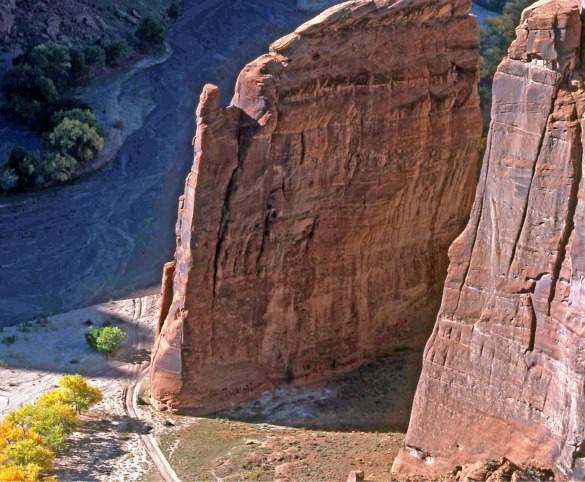 Navajo National Monument— Hike or ride horseback to see ruins of ancient pueblo. Window Rock— Visit the town and the rock for which it was named. Be sure to visit the Navajo council chambers if possible to see the beautiful murals inside, and the art and history displayed at the Navajo Museum. 7. Where can I sleep? Among the variety of chain motels on the reservation, some are run by the Navajo Nation. All sorts of lodging are listed on the Discover Navajo site. If you want to camp instead, nine campgrounds/RV parks are scattered across the land. The camp site at Canyon de Chelly is particularly lovely, located in the bottom of the canyon, shaded by very old cottonwood trees. 8. Where can I eat? Once you leave Flagstaff in Arizona or Albuquerque in New Mexico, do not expect a great variety of gourmet food. However, you will find good basic Mexican food with a Navajo influence, as well as fast-foot American and a few Chinese restaurants. Fry bread, mutton stew, and Navajo tacos are standard regional fare. Out in the wide open spaces, where fast food disappears, you may be able to grab something to eat at a trading post. 9. 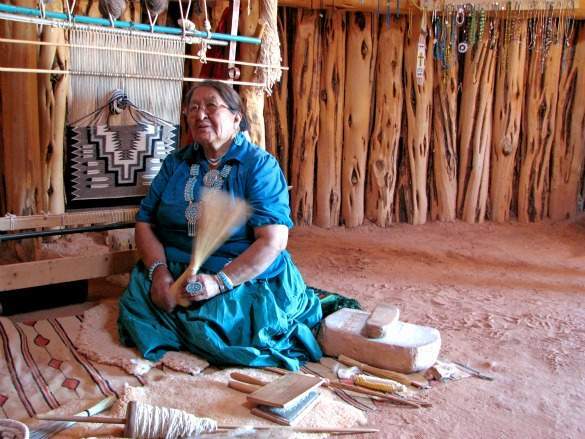 Where is the best place to shop for Navajo arts and crafts? If you want to buy good quality, guaranteed handmade Navajo crafts, stick to trading posts like those at Cameron or the Hubbel at Ganado. Museum gift shops and Navajo Arts and Craft Enterprise centers in Chinle and three other towns guarantee good quality as well. These rugs, silver and turquoise jewelry, and other items take a long time to make and great skill, so they are very expensive. On the other hand, whole families may run a roadside business selling strings of beads and “turquoise”– that is probably plastic– set in necklaces and earrings likely made in China. 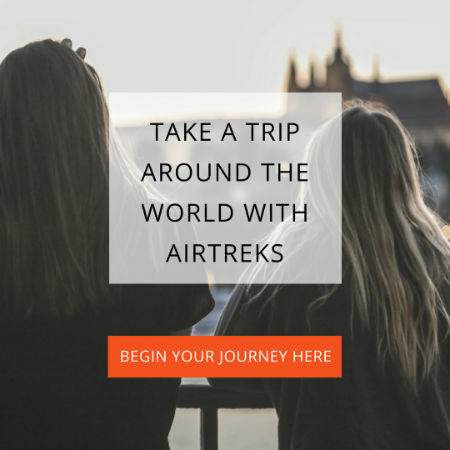 Some travelers enjoy buying from these sellers and the interaction can be fun. However, understand that dirt cheap usually means machine made. 10. What books can I read in advance to enhance my experience? Jim Chee and Joe Leaphorn series by Tony Hillerman as I suggested in tip #4. If you don’t read him before you go, you will have plenty of opportunities to buy his books which are generally for sale at trading posts and gift shops. Diné by Peter Iverson, will give you a more academic approach to the history and culture of the Navajo, but in an easy-to-read style. Iverson grew up on the Navajo reservation, so adds his professional study to personal experience. If movies are your favorite prep for travel, try to find a DVD of Miss Navajo, a made-for-TV documentary. Vera Marie Badertscher has lived in Arizona and traveled in Navajo Land for decades. She recently co-authored a book with Charnell Havens, Quincy Tahoma: The Life and Legacy of a Navajo Artist. During their research on the book, the authors traveled extensively on the reservation. You can learn more about their work at Tahoma Blog. Vera Marie also publishes A Traveler’s Library, dedicated to books and movies that inspire travel.